Winona, MN – Peerless Industrial Group, Inc. introduces their ATSB, Adjustable Telescopic Spreader Beam ideal for outdoor construction applications and for areas where headroom is not limited. It is ideal for accommodating various size loads and utilizes an upper rigging spread between two lift points that adds extra stability to the lift. 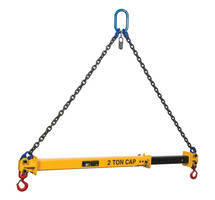 It is supplied with a pair of heavy-duty swivel hooks. Additional lift points and hardware are available as options. Peerless’ ATSB Adjustable Telescopic Spreader Beam is available from 2 through 40 Ton capacities with outside spreads that adjust from a minimum of 4 to 6 feet to a maximum of 12 to 20 feet. Additional sizes and capacities are available. The ATSB is engineered and manufactured to ASME B30.20 & BTH-1 Design Category B Service Class 2 and has a specified fatigue life of 100,001 to 500,000 load cycles. All ATSB, Adjustable Telescopic Spreader Beams are Proof-Tested to 125% capacity. For more information about the Model ATSB Adjustable Telescopic Spreader Beam visit our website at https://www.peerlesschain.com/products/ATSB/. Peerless Industrial Group, Inc. has been innovating successful products for over 100 years. Today, as a worldwide provider of lifting solutions, utilizing our exceptional design, engineering, manufacturing, and quality teams, Peerless continues to develop crucial products for the wide variety of markets they serve. Peerless is part of KITO Corporation’s global network providing our customers access to overhead lifting, below-the-hook and material handling, cargo control, hardware, marine and traction products. For more information about Peerless Industrial Group, Inc. visit us online at www.peerlesschain.com.